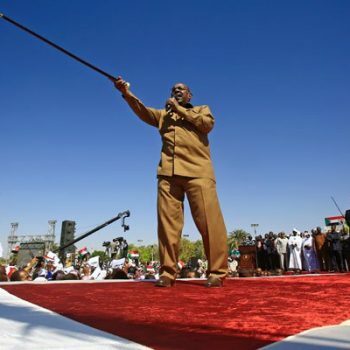 Sudan’s Bashir Overthrown By The People And Army He Ruled With An Iron Fist. A career soldier, Bashir was well known for his populist touch, insisting on being close to crowds and addressing them in colloquial Sudanese Arabic. He was indicted by the Hague-based ICC in 2009 on war crimes charges over a long-running conflict in Darfur, but went on to win re-election twice in polls boycotted by opposition groups. In 2010, he was also indicted by the ICC for alleged genocide. But it was a government decision to triple bread prices that brought protesters onto the streets in December last year, as the country grappled with regular shortages of food, medicines and foreign currency. The protests morphed into nationwide demonstrations against Bashir ‘s rule, triggering unrest that also left hundreds wounded and thousands jailed. Bashir addressed several loyalist rallies, promising to promote economic development and peace across the country, but his words fell on deaf ears. Known for his trademark dancing and waving of a stick before addressing loyalists, Bashir had defiantly said at a recent rally of supporters that “demonstrations will not change the government”. But as the pressure on the street grew, he stopped talking of bidding for a third presidential term in a vote that had been due to be held next year. Despite the ICC indictments, Bashir had regularly visited regional countries and also Russia. Days before the protests erupted he travelled to Damascus to meet Syria’s President Bashar al-Assad, becoming the first Arab leader to do so since the Syrian conflict began in 2011. At home, Bashir last year hosted talks between neighbouring South Sudan’s leaders, helping to broker a tentative peace deal after five years of intense conflict in the world’s newest country. South Sudan had gained its independence in 2011, when Bashir surprised his critics by giving his blessing to a secession that saw the south take the bulk of Sudan’s oil fields, some six years after a peace deal ended two decades of north-south conflict.